Onderdonk, a painter best known for his landscapes of the Southwest, was born in San Antonio, Texas in 1882. As a child, Onderdonk exhibited artistic talent, and had voiced a desire to be an artist by the time he was five. He received his earliest training from his artist father, Robert Jenkins Onderdonk. At age 18, he traveled to New York City to study at the Art Students League. There, he was a pupil of Kenyon Cox for one year, before attending William Merritt Chase's Shinnecock Summer School of Art on Long Island. Instruction and criticism from Chase, who had also taught Onderdonk's father, had a lasting impression on the young artist. At the end of the summer, Onderdonk had decided to attend Chase's New York School of Art. He also studied with Frank Vincent Dumond and Robert Henri. During his student years, Onderdonk painted prolifically to support his studies. By 1903, he had work accepted by the Society of American Artists. In 1906, he was hired by the Dallas State Fair Association to organize an art exhibit. Onderdonk continued working for the fair until his death in 1922. 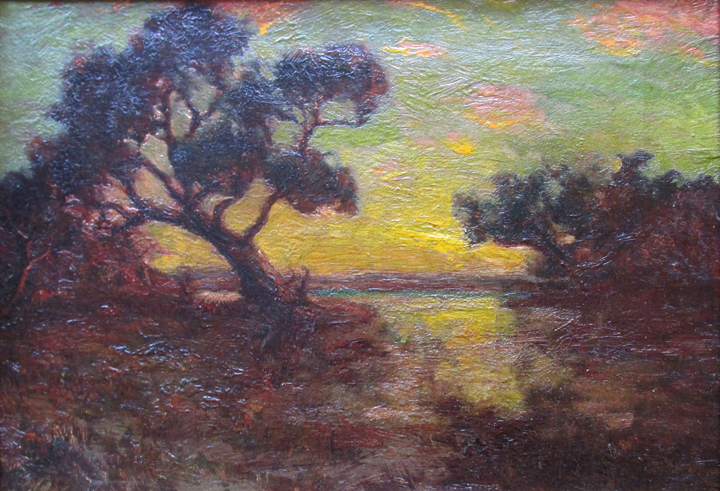 During the early part of the century Robert Julian Onderdonk was the most famous artist in Texas. His style matured over the last fifteen years. He was a severe critic of his own work, and continually painted over earlier canvases that did not meet his exacting standards. By 1914, his panoramic vistas became popular with art collectors in Texas, New York City, Chicago and Los Angeles.